The latest detentions in Saudi Arabia and Saad Hariri’s resignation from the Lebanese Premiership from Riyadh is reflective of a continuing project to transform the Middle East, which has encompassed regional heavyweights and crisis zones alike, and seems set to crystallize existing regional rifts. The effort to counter Iran serves as a platform upon which the current polarized atmosphere is in the process of transitioning into a period dominated by conventional conflicts as well as proxy wars. 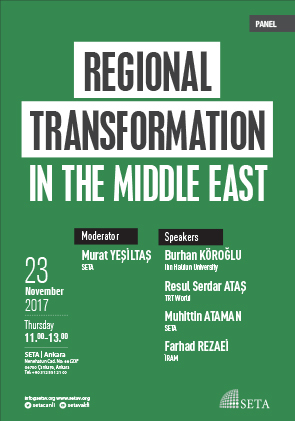 SETA cordially invites you to a panel discussion entitled, “Regional Transformation in the Middle East” during which panelists will discuss whether there is more than what meets the eye to this current state of affairs in the region. NOTE: The panel will be conducted in Turkish and English. Simultaneous translation will be provided.